Edward Gibbon Wakefield was English, as were most of the initiators of the New Zealand Company. Not surprisingly, over 80% of those assisted to migrate by the company were English, as were those who migrated after 1850 with the help of the Canterbury Association. 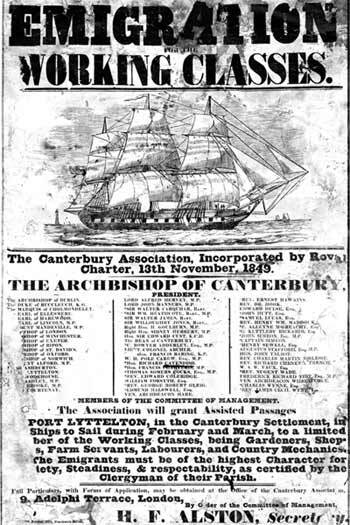 This poster offered assistance for suitable immigrants to Canterbury. Those interested were asked to apply to the office in London. Hi Michael, thanks for your comment. Permission must be obtained from Canterbury Museum for any re-use of this image. Please get in touch with them quoting the reference / Te Ara page. Thank you.